The Day of the Dead is a major holiday in Mexico, joyfully paying respect to the ancestors. The holiday inspired Monica Knighton's Tarot of the Dead, which honors the dead and death itself. The deck generally adheres to the imagery of the Rider-Waite-Tarot. The number is placed within the card at the top, and the title is placed within the card at the bottom. The background for the suits is color coded: green for Coffins (cups), yellow for Reels (coins), beige for Pistols (swords) and blue for Pens (wands). 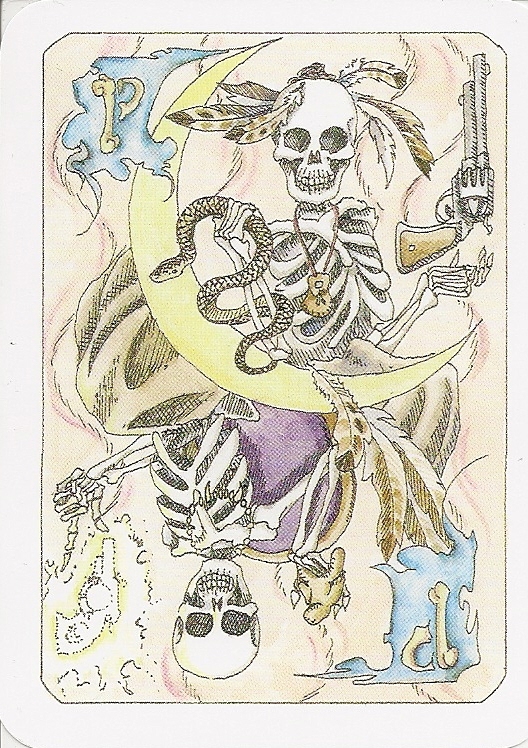 The deck has only skeletal figures except for the Death card. The courts and the pips at first appear to be double ended, like a regular playing card. Careful inspection reveals that these cards contain two images one for the upright and one for the reversed different postures and actions for each. The backs of the cards is black and white showing two skulls set end to end, so that it cannot be determined if the card is reversed or not. The art is pen, ink and watercolors on Bristol board.